Feeling uncomfortable about someone's birthday approaching, stuck in search of a perfect gift? The ideal gift should pull at the birthday girl or boy's heartstrings and set the table in a roar simultaneously. The solution is surprisingly easy, off the beaten path and creative - a happy birthday video with photos and videos, animation effects and the birthday person’s favorite song will surely hit the nail on the head. Even if you are making a gift for one of your grandparents, your spouse or hairdresser, the ideas below will certainly help you create the best gift of the year. Nowadays making a multimedia gift using your own skills and imagination doesn't seem scary and mysterious. You don't need to be a video montage guru or a designer to create a birthday video. 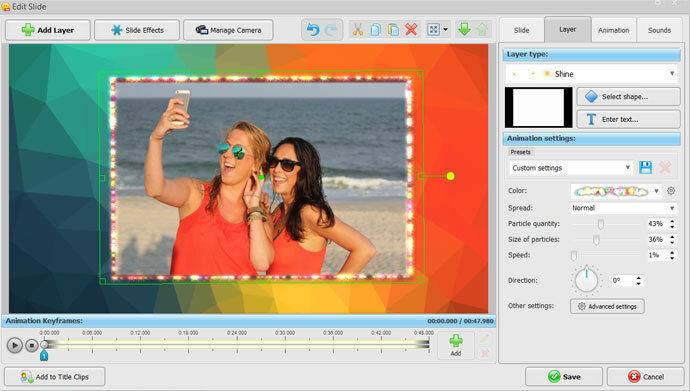 A popular birthday video maker with a song enables to merge photos and videos into one jazzy mix taking advantage of intuitive editing tools and hundreds of special effects. Want to see a sample birthday video to inspire you? Find one below! This fascinating presentation puts the focus on the portrait photos - any birthday girl would love it. An abundance of floral frames, fancy ribbons, and other themed embellishments add to the festive mood. How to make a happy birthday video if the birthday party is tomorrow or if you want to spend minimal time and effort to get it? The "Slideshow in 5 Minutes" option is the thing you have been looking for – it combines animation effects, backgrounds and transitions in ready-to-use themed styles. When starting the software, go straight to that option and find the necessary pre-designed theme. Those listed in Celebrations and Modern Style suit teenagers and adults of different age and tastes. For a child, look through the Family and Children group - all the slideshow themes offered here are embellished with animated clipart, so the kid will be watching the video like a cartoon. If you are preparing a gift for your beloved one, check out the Love and Wedding group. And then there are only three things you need to do – add the photos and music, play the video to check if everything is ok and then export it in the video type you need. The gift is ready and you may rest easy! 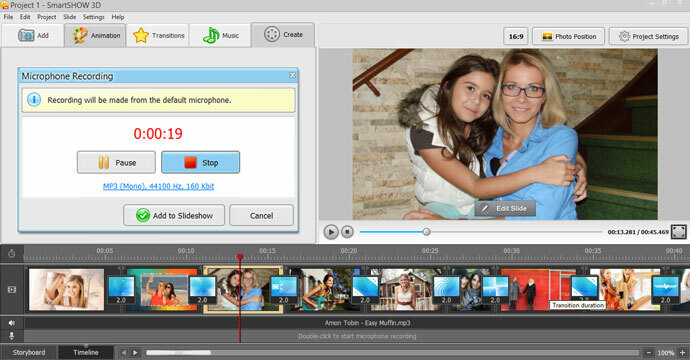 If you want to create a happy birthday video all by yourself, make use of all the tools the software is packed with. First, add photos and videos in the order you prefer. Then go to the Collages tab and select one to make several photos float or rotate around each other on a slide. You may experiment with the way the slides change in the Transitions tab; however, avoid using too many different transition styles throughout your video – such an excessive diversity may obscure the photos themselves. In the Animation tab, you can pick out some motion, 3D or nature effect that will turn your photo into a moving filmstrip, a winter tale illustration, photo filters demonstration, etc. – there are plenty of cool effects to give your video a real festive look. Eager to make a happy birthday video that will stick to everyone's memory? Here is the trick – add a video greeting captured with your webcam or mobile and insert it among the photos. Or just find some video picturing the birthday person – previous parties, graduation, family archives. Add the video, then go to the slide editor and open the Layer tab if you need to cut it. Try applying some Slide Effects. Flicker and glowing shapes will add some festive mood to your happy birthday video. If you are worried that the quality of the clip leaves much to be desired, you can place more than one video on a slide and resize them as you need. How about pumping up the audience? Launch your happy birthday video maker with a song and switch to the Music tab. Add one music file or a bunch of them. Cut them as you need, and arrange one after another using the Timeline. You can also record some Voice Comments with your microphone and insert them in your video. Remember to adjust the volume for the song and the recorded message. If you want the comments to run simultaneously with the song, make the volume of the latter less than that of the voice record. Enable fade-in and fade-out to avoid abrupt transitions between different songs or between comments and songs. When you finish editing your video gift, go to the Create tab and select the export option you need. For the best quality, opt for Full HD video – you can burn it to disc, play during the birthday party or publish online. To make a happy birthday video is to make dearest one star in the movie that’s all about him or her. Learn more about how to make video birthday card with text comments and create a brilliant personalized gift. Got inspired? 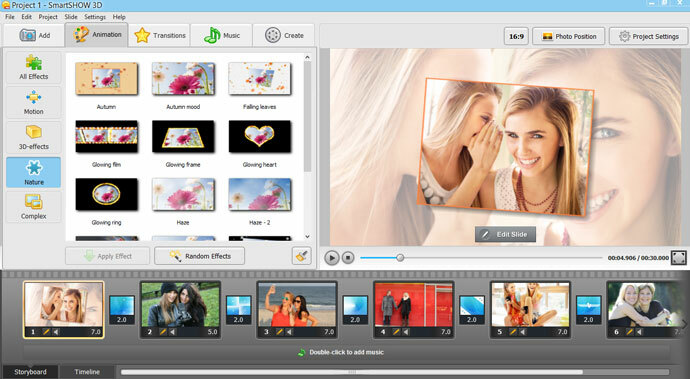 Start the software and mix photos & videos the way you like – be sure that the birthday person will salute your creativity!